An Irish bat typically becomes active in late spring and early summer. As the days and nights warm up a bat flies out to forage for insects for progressively longer periods at night. 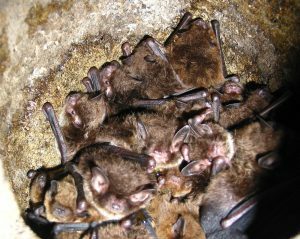 Also around early summer a number of female bats get together in a suitable nursery or maternity roost. The group is known as a colony. Few adult males may be present in the nursery, excepting brown long-eared bat nursery roosts which may have as many as 15-30% males. A nursery roost is usually warm, undisturbed and situated close to suitable insect-providing habitat. Numbers of bats in a nursery roost may build gradually until the time that the mothers give birth, around late June or early July. They each give birth to a single baby that they can identify by its smell and sound. The mother suckles her baby with her own milk. She rarely carries her baby with her when she is flying outside the roost unless she is moving from one roost to another. A bat pup is born blind and without fur but it is otherwise well developed and weighs up to one third the weight of its mother at birth. The mother feeds it milk for several weeks at which point it is able to fly and learns to echolocate and catch its own prey. By 6-7 weeks after birth the young are independent. The females usually leave the maternity roost in August and avail of late summer’s insects to build up a store of body fat to help them survive the winter. Females then seek out males who have set up mating territories by mid-August. Mating takes place from August onwards. Mating may take place in a swarming site – which may be a cave or large underground site, or may take place in a roost protected by a single male (a harem). The female retains the sperm throughout the winter but does not ovulate and become pregnant until spring, after hibernation. Then as temperatures drop further during the approach of winter and insect numbers decline, males and females move into hibernation roosts (hibernacula). 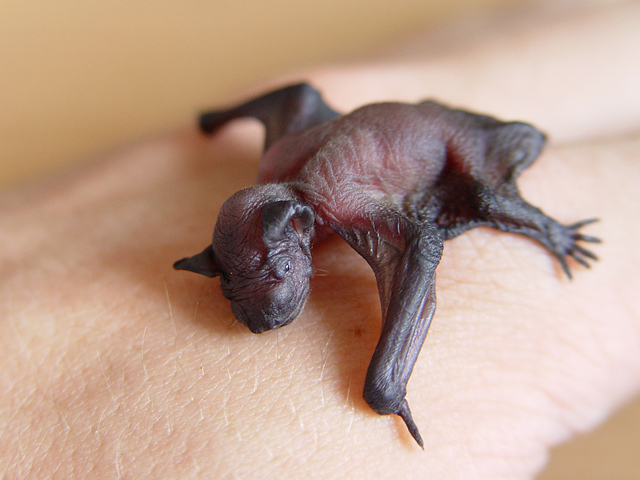 In Ireland, bats are the only mammals apart from hedgehogs that undergo true hibernation. Hibernation takes place from October/November onwards during which time a hibernating bat uses very little energy and its body temperature drops to 8-9°C. 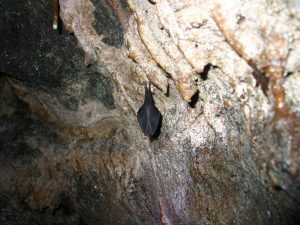 Very little is currently known about where Irish bats hibernate since most species, apart from the lesser horseshoe bat, do not use caves for hibernating, unlike continental Europe. Individuals may wake up occasionally during mild spells to eat and to drink water. 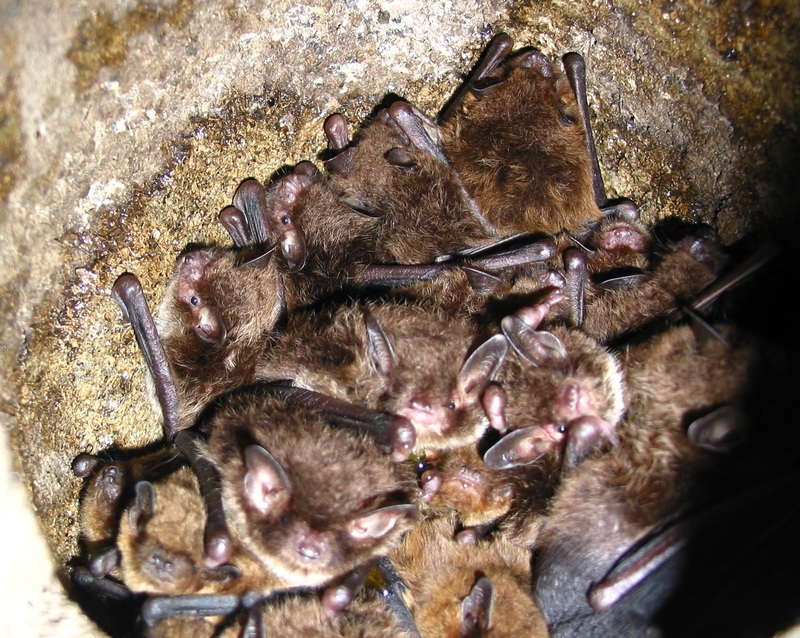 By spring bats gradually wake up to begin the yearly cycle again. The average lifespan of Irish bats is thought to be 7-8 years although some have been found over 15 years old. The longest lived bat ever recorded was a Brandt’s bat that had been ringed in Siberia and was refound in Russia 41 years later. Bats are very long lived for their size (compared, for example, with mice or shrews that usually don’t live more than a year or two) and are now the subject of cutting-edge research at UCD to see if they can provide insights into the secrets of aging.